This week, I experimented with a new recipe in my Simply in Season cookbook in the Spring season section. I love this cookbook because, they focus on eating local, seasonal whole foods and provide suggestions for altering the basic recipe. Every other Tuesday, we get our organic produce box delivery and I was expecting asparagus. Luckily, the Simply in Season cookbook has many suggestions for that springtime veggie. I chose the Asparagus Pancake (p. 62) and added my own flair, including leftover Easter ham (thank you to my in-laws for making a great meal and leaving us the leftovers!). I added the ham to make the entree more substantial and ham compliments asparagus so it was a win! Aaron was skeptical, but in the end, he said he liked it. Pancake for dinner? The word "Pancake" might be confusing. This is a savory pancake, similar to a German Apple Pancake, so it is more like a souffle. I added seasoning and my favorite cheese on top - Amish Butter Cheese. You can substitute that cheese for a high quality herb goat cheese, Fontina, or sharp white cheddar. This spring entree is really easy (maybe 35 minutes start-to-finish) and I made it while the baby was happy and fresh from nursing. 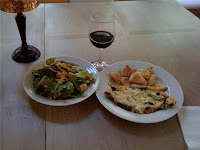 I served this entree with a green salad, toasted pita wedges (super easy, see below), and a glass of red wine. I felt very French for some reason! Ha! Blanch asparagus - see my post for instructions. DO NOT OVERCOOK! It should be bright green. Preheat oven to 400 degrees. Add 1 tbs butter to a pie plate and put in the oven for 3-4 minutes as the oven is preheating. This step really saves time! While asparagus cooks, cut ham into chucks. In a medium mixing bowl, whisk buttermilk, flour, eggs, salt, and herb seasoning. Drain asparagus and slice into 1-inch pieces. Pull out the pie plate from the oven. Using an oven mitt, carefully swirl the pie plate with the melted butter to coat the bottom and the sides of the plate. Place ham chunks and blanched asparagus spears. Pour pancake batter evenly over the ham and asparagus. Cook pancake mixture in 400 degree oven for 20 minutes. If you have a convection setting, you can use that to cook the pancake evenly. While it is baking, shred cheese and prepare salad. When the pancake is done cooking, it will be puffed up. Make sure the pancake is set and cooked through. Cover evenly with shredded cheese, cut into 3 pieces and serve immediately. Toasted Pita Wedges: When I finished making the salads, I prepped the pita wedges. Slice the pitas in wedges and place on a cookie sheet. Coat evenly with cooking spray and sprinkle with sea salt and the same seasonings you used for the pancake. Love that Mural of Flavor for that! When you pull the pancake out of the oven, change the setting to broil and place the pita wedges in the oven for 2-3 minutes. Serve immediately. Berkey Family Update: Ava is 6-weeks! Ava is 1 month old! Baby Ava is 21 days old!